Vitto aggressive early. Gets the bucket down low on a nice look from Happ. Badgers' offensive spacing looks good to start the game. #badgers up 10-4 at the first break. Happ with 2 points and 2 assists. Brown with 5 points. Happ scores inside and is fouled. #Badgers 2-2 from deep and 4-6 overall. 10-4 lead with 15:30. Happ to line. AND-ONE for Happ. TO on the floor before the free throw. Wisconsin up 10-4, 15:30 left in the first. "Let's go Badgers" chants getting loud. Great start for Wisconsin. Badgers lead 10-4 and Happ to the line for a 3-point play chance after the timeout. UW on a 7-0 run. "Let's go, Badgers" chants reign down inside MADISON Square Garden. UW 4 of 6 overall, 2 of 2 from 3-point range. Florida 2 of 7, 0 of 2. Gators slow on offense so far: 0-2 from deep and 2-7 overall. Settling for jumpers. Brown has a game-high 5pts for the #Badgers . Koenig with a triple. Happ will shoot an and-1 FT after the timeout. Eight possessions: Happ 3 points, 3 assists that led to 8 points. #Badgers have 4 assists on 5 baskets. Not sure about that offensive foul on Hayes. Khalil Iverson dunks are fun ???? Showalter to Iverson for a slam and it is 16-6 #Badgers with 13:26 left in half. UW has 5 assists and is 6-8 shooting. Wisconsin on a 13-2 run over the last 3:41, including a vicious dunk by Khalil Iverson. 16-6 Badgers. Timeout Florida. And the jam by Iverson. Badgers up 10, shooting 75% from the floor. 16-6 UW, TO on the floor with 13:26 left in the first half. Flight 21 just took off again. Badgers on a 13-2 run. Five different #Badgers have scored, led 5 points from Vitto Brown. 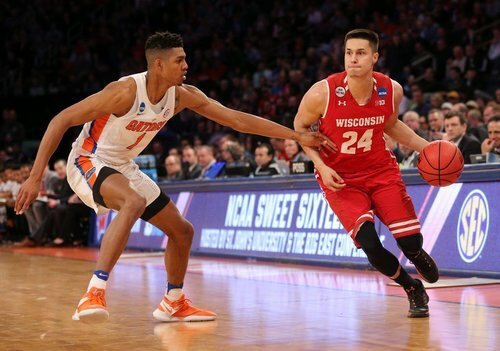 Wisconsin goes on a 13-2 run to lead the Gators by 10. So many good numbers right now: 5 different scorers, 16 points in 10 possessions, 6-for-8 shooting, 3-for-3 from 3, 5 assists thus far. #Badgers up 16-8 with 11:50 left. Vitto Brown with 5 points to lead all scorers. KeVaughn Allen, Gators' leading scorer, hit first shot. Is now 1-6 and 4-27 in the tourney. #Badgers up, 16-8. #Badgers Trice got two quick fouls vs. Nova and has done the same here, with 11:50 left. Florida's KeVaughn Allen is 1 of 6 from the field, 0 of 2 from 3-point range. That puts him at 4 of 27, 1 of 15, in tourney. D'Mitrik Trice picks up his second personal foul. He'll head to the bench. Timeout on the floor. Hayes up to 7 points, all on jumpers, and the #Badgers lead 20-11. Hayes is feeling the stroke from midrange. Welcome back, old friend. Nigel Hayes with 7 points on 3-for-5 shooting. The senior has turned into a different player over the last three weeks. #Badgers Hayes missed two post-up moves early and is on fire now. Hayes draws the and-one on the jumper from the top of the key. #Badgers @NIGEL_HAYES is off to a HOT start... 4-6 and 9-points. All makes are away from the hoop.